Thammasat Business School (TBS) was established in 1938 as the Faculty of Commerce and Accountancy. 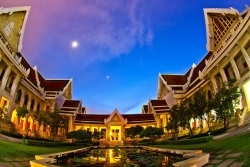 It is Thailand’s second oldest institute of higher education, offering a wide range of business education from Bachelors to Doctorate levels, in both Thai and English. TBS has earned the reputation of being one of Thailand’s best business schools with over 40,000 alumni located throughout the world. The outstanding achievements of TBS allowed it to receive EQUIS accreditation in 2012. 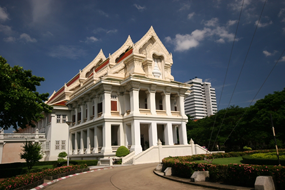 Chulalongkorn University is the oldest and most reputable university in Thailand. The University is acclaimed as the “most prestigious university in the country”. The school’s name is derived from King Chulalongkorn V, and established by King H.M. Vajiravudh VI. H.M. Vajiravudh VI developed the university into a nationally-sponsored administrative college and expanded many academic programs. In early 1917, Chulalongkorn University had already reached the scale of a modern teaching and research institution. The school’s historical tradition has also developed a special moral network. The network’s main objective is to guide students in daily life to promote appropriate behavior and professionalism that in turn makes the academic setting and the student body more attractive. Due to the global market’s lack of engineering intelligence, Chulalongkorn University established its International School of Engineering (ISE) in 2005 to cultivate advanced international engineers through its English-taught program. Chulalongkorn University’s Sasin Graduate Institute of Business Administration was founded in 1982. Recognizing the lacking talent among senior business management education at that time in Asia, the Sasin Graduate Institute of Business Administration established relations with two American schools, the Kellogg School of Management (Northwest University) and the Wharton School (University of Pennsylvania), to bolster its offerings at home and its international outreach. Additionally, the Institute invites faculty members from the two renowned American universities to lecture in Thailand, intending to duplicate the successful experience of senior business administration education of prestigious Western universities. Sasin Graduate Institute of Business Administration has become the first Thai university to acquire both AACSB and EQUIS international accreditations. The university is currently also a member of the Association of Asia-Pacific Business Schools (AAPBS) and CFA Institute (Chartered Financial Analyst).